Now you have the opportunity to learn how to add a beautiful manicure, quickly and easily with Gloss Cosmetic's exclusive products. The course is suitable for anyone who wants to work with nails. The treatment is both popular and traditional. At this course you will learn everything you need to start working as a professional nail designer. We will review all the material in the theory and practice of the course. The course is very intensive but it will require you to practice at the end of the course. The teaching is structured so that we go right from the first moment on the practical part. 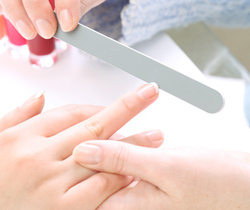 After completing your course, you will receive a diploma in that you have passed the course in Gloss Manicure, which is internationally approved. You need 1 or more models for the course from 10:00. Please tell in advance if we are to help you get models.